I’ve been binge reading the Dresden Files for the last month, and whenever I read a long series that I get really into, I almost invariably dislike the next book I read because it can’t compare to the bond I’ve built with the characters I’ve spent so much time with recently. 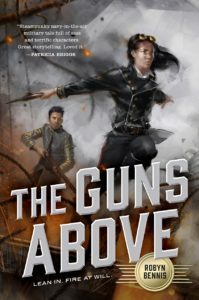 The Guns Above is one of those few books that put the “almost” in the previous sentence, because despite the odds, I really liked it. Josette Dupre has just become the first female airship captain in the history of the Garnian military, promoted for her distinction in battle by direct order of the king. This doesn’t sit too well with the the general in charge of the ongoing war and her new command ends up being an untested and probably dangerous airship. To make matters worse, she is ordered to take the general’s nephew, Lord Bernat, along as an observer on her mission to and she knows that his job is to report her behavior unfavorably no matter what she does. This book reminded me a lot of the Shadow Campaigns series by Django Wexler – they have a similar technology level (minus the airships), and both are about women who are soldiers above everything else. The airships and how they work are described in loving detail, and it helps make the world feel lived-in. The plot is fairly basic, but it feels exciting because there’s a lot of action that’s very well done and uses the airships in ways unique to their design. I am often skeptical of steampunk books because I’ve read a few of them that are great about describing the technology and world, but don’t do a great job with the characters. I was pleasantly surprised to discover that characterization was one of this book’s biggest strengths. All the characters seem like normal people, admirable in some ways, deeply annoying in others, and very relatable overall. Bernat is an insufferable jerk and never really ceases being one, but the author somehow manages to make him lovable somehow. Josette is witty, courageous, and determined to a fault, but the flip side of that is that her single-mindedness makes her pretty scary and/or mean on occasion. And even though she is relentless in the air, she’s still vulnerable when facing people with the power to take away what she loves. Both Josette and Bernat are both viewpoint characters, which is fun because for most of the book, they’re never more than a few feet from each other and so we’re getting wildly different perspectives on the same events in real time. The Guns Above is the first of a series, but you wouldn’t know that from the ending, it tells a complete story without any cliffhangers. And it’s a debut novel, which I wouldn’t have guessed from how polished it is. I’ll definitely be reading further books in the series. This entry was posted in Books, Reviews and tagged book 1, fantasy, fiction, steampunk by Kriti Godey. Bookmark the permalink.